Regardless of which type of mulch you prefer for your garden or landscaping, you’ll need to do some calculating to determine how much to purchase. Guess wrong, and you’ll either come up short or end up with a surplus. Here’s how to do the math to make sure you get the amount right. What size is your garden bed? To determine how many cubic feet of mulch you need, we must start with calculating the square footage of the area you wish to cover. Next, you need to decide how deep you want to layer the mulch. Two or three inches is typically an effective depth for most vegetable gardens or flower beds. Now take the square footage of your bed and multiply by your desired depth. Using the example above and assuming a 3-inch depth (0.25 feet), the total amount of mulch needed would be 300*0.25 = 75 cubic feet. But what if you have a round garden bed? As with a rectangular or square garden, you need to decide on a mulch depth and multiply by your square footage. So, if we assume a 3-inch depth (0.25 feet), the total amount needed for our example would be 38.5 cubic feet. The last step is to convert your desired square footage of mulch into cubic yards, as The Dirt Bag sells mulch by the cubic yard. To make the conversion, divide your total by 27, as one cubic yard of mulch is 27 cubic feet. 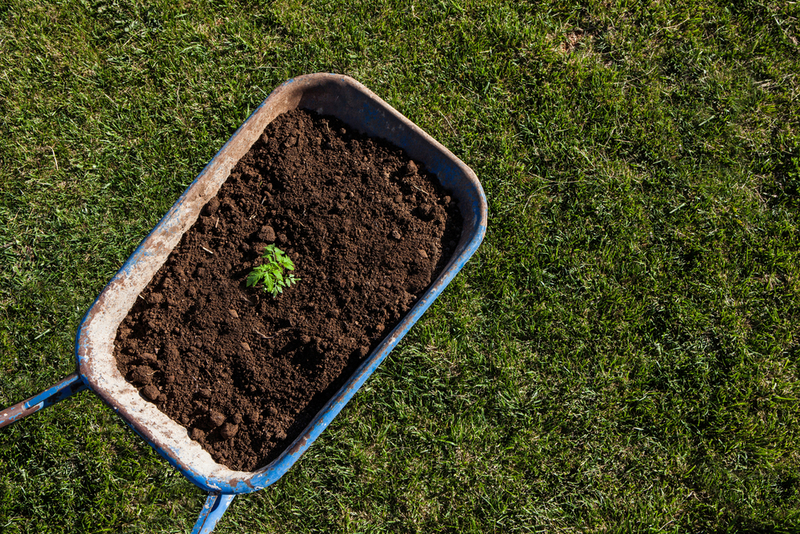 Then, round up to the nearest whole number to calculate the number of bags of mulch you need to cover your soil. Rounding up, a total of three bags of mulch would be needed to cover a three-inch depth. In this case, two bags of mulch would provide ample coverage. Now, if you’re not too keen on math, don’t worry. You can always use the handy-dandy coverage calculator on The Dirt Bag website. We offer bagged mulch as well as bulk mulch products, all available for delivery throughout Northern Utah. For every product we offer, including garden soil, topsoil, compost, play sand and landscape rock, simply look to the top right corner of the screen and click on the yellow “How much do I need” calculator button. The Dirt Bag, located in West Jordan, Utah, makes it easy for you to order all the products you need for your garden and landscaping needs. Give us a call or visit us online today to order your Utah mulch delivery.